At a recent new staff training, we were watching clips from the movie "Francesco." One thing that inspired me was that Francis of Assisi did not have all the answers. He was graced with an inspired spiritual intuition to see each other as family, as brothers and sisters no matter one's social status. One of the implications of this is that he needed help and we need one another. Others in the Franciscan tradition such as St. Clare and St. Bonaventure helped by breathing a lasting energy into the Gospel inspiration that so moved St. Francis. 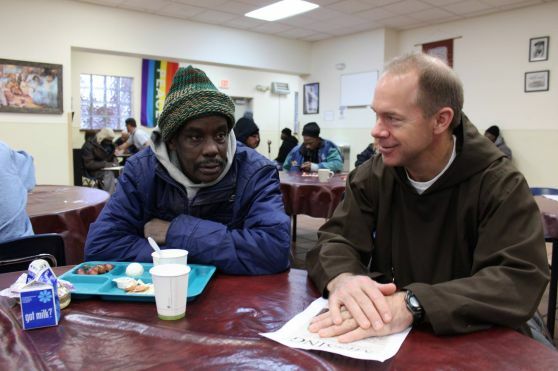 Looking around the table at the women and men who have been new hires for the Capuchin Soup Kitchen in the past six months, I could see elements of that same inspiration that drove St. Francis. Many people carry out that inspiration in many ways whether in their own lives and work or at the soup kitchen itself. It's that inspiration that drove Blessed Solanus Casey and our current Pope Francis. This inspiration is captured well in the song, "Make me a channel of your peace, where there is hatred let me bring your love, where there's despair in life let me bring hope."